MYDAWA partners with Pharmtechs to deliver medication and wellness products. MYDAWA, the e-health platform whose vision is to achieve better health outcomes by providing access to quality and affordable medicines conveniently and with privacy has announced another first for the Industry in Kenya by using Pharmtechs to deliver medication and wellness products. Along with delivery, patients will be given advice on managing the condition/disease and/or the medication being administered. Patients will also get direct information on possible side effects, can clarify correct dosage and timings as well as counselling services. The Pharmtechs (Pharmaceutical Technologists) are fully qualified and licenced by the PPB and are members of their professional association, the Kenya Pharmaceutical Association (KPA) who promote and ensure the provision of good pharmaceutical practice delivered ethically to the required and expected standards. The move is set to further revolutionise healthcare provision with the aim of reducing medicine non-adherence hence ensuring better health outcomes and ultimately aiding the progression towards Universal Healthcare (UHC). According to the World Health Organization, only 50% of people typically follow the doctors’ orders when it comes to taking prescription drugs. A study by The Centre for Disease Control and Prevention (CDC) reveals that in the US alone, medicine non-adherence accounts for 30% – 50% of chronic disease failures and causes 125,000 deaths per year. It is also estimated that 33% to 69% of hospital admissions in the US are due to medication non-adherence. In Kenya, a study in the International Journal of Science and Research Methodology noted that Antiretroviral (ARV) adherence levels in some instances were at 68% in 2017 against the recommended adherence level of >95 required for the suppression of HIV. Another study shows that non-adherence among diabetes patients taking hypoglycaemic oral drugs was at 45.1% in 2015 while a study by the Pharmaceutical Journal of Kenya 2015 at Kenyatta National Hospital, medicine non-adherence was at 80.9%. 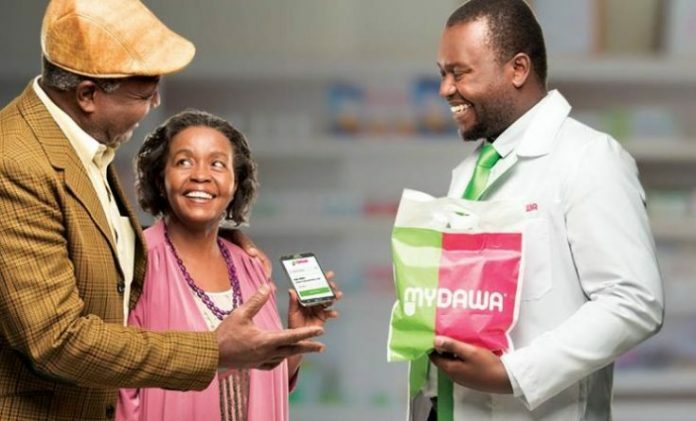 Tony Wood, the MD at MYDAWA, stated that MYDAWA was very focused on delivering better health outcomes, going on to say that The introduction of pharmtecs for delivery of prescription items direct to patients is another example of how we are constantly innovating to raise the level of care to Kenyans. Cost and convenience are mostly cited as the main hinderances to taking prescription medicines. The result is medication non-adherence can lead to poor health outcomes which can further lead to increased service utilization and as a result increased healthcare costs which are passed on to the patient. MYDAWA already addresses the cost element and now seeks to further address the non-adherence challenge by making it more convenient for patients, in order to reduce the levels and continue to achieve better health outcomes.